Iceland is one of the most enchanting countries I’ve ever visited. I felt like I was on another planet walking through lush greenery, volcanic fields and cool blue lagoons. The country has over 100 active and inactive volcanoes and more than 10,000 waterfalls to discover. There is so much adventure to be had here, I can’t wait to go back. 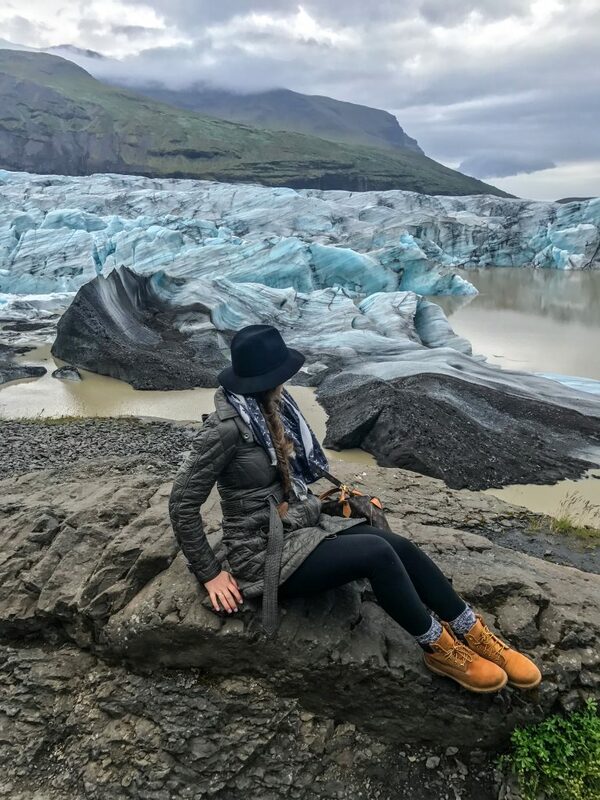 I know this is a lengthy post, but I’ve had the most questions about our trip to Iceland so I wanted to do this beautiful country justice. 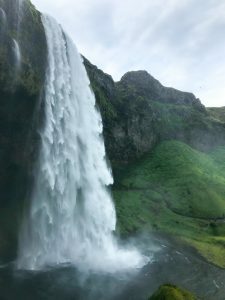 Iceland has been on my bucket list for several years. 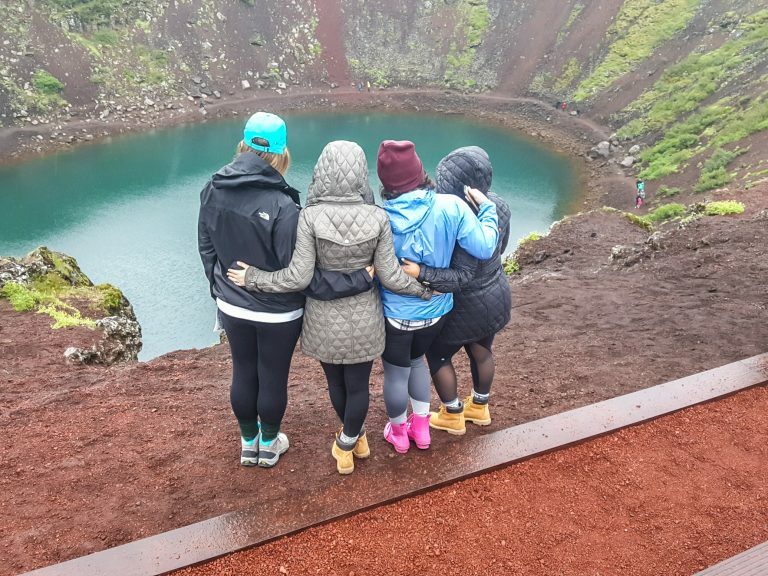 Every time I would log onto Pinterest I would see a picture of the Blue Lagoon and magnificent glacier lagoons. 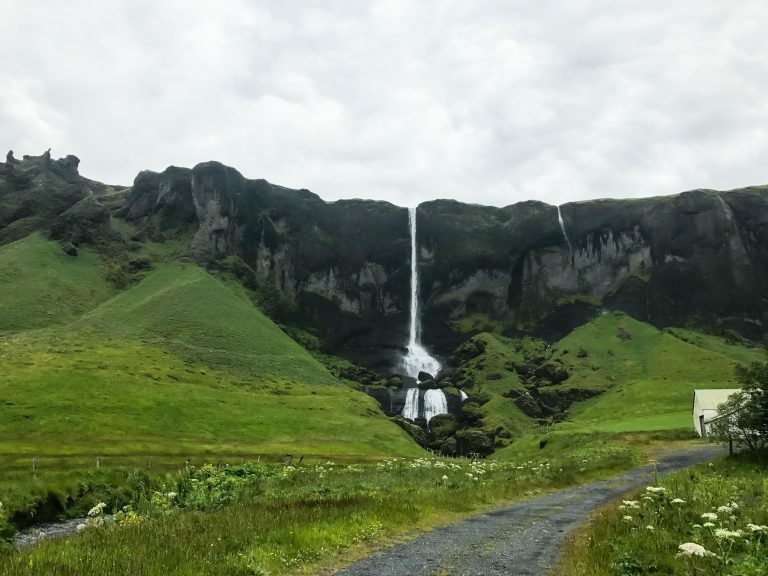 It wasn’t until July of this year that I decided to finally cross Iceland off my bucket list. Let’s start at the beginning! Back in 2009 when I first visited Paris, I fell in love with the city and I knew I wanted to come back to spend my 30th birthday there. Fast forward to 2017 and my dream was becoming a reality. I started to plan my next European adventure. (Paris blog post coming soon). 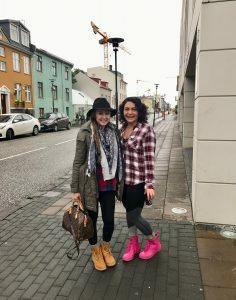 Iceland was a perfect place for a 3 day stopover during my European travels. The flight from Chicago to Reykjavik averages about 5 hours and 30 minutes, while the flight to Paris direct is about 9 hours. 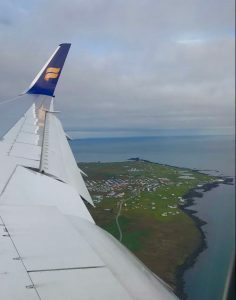 After some research I found that Icelandair flew nonstop from Chicago to Reykjavik and tickets can be as low as $200-$300 per way. They also fly direct from other US cities including Boston, DC, Denver, Seattle and several more. Another huge selling point is that Icelandair flies nonstop from Reykjavik to many major cities around Europe for pretty cheap including: London, Paris, Copenhagen, Berlin, Dublin, Milan, Amsterdam, Madrid and many more. 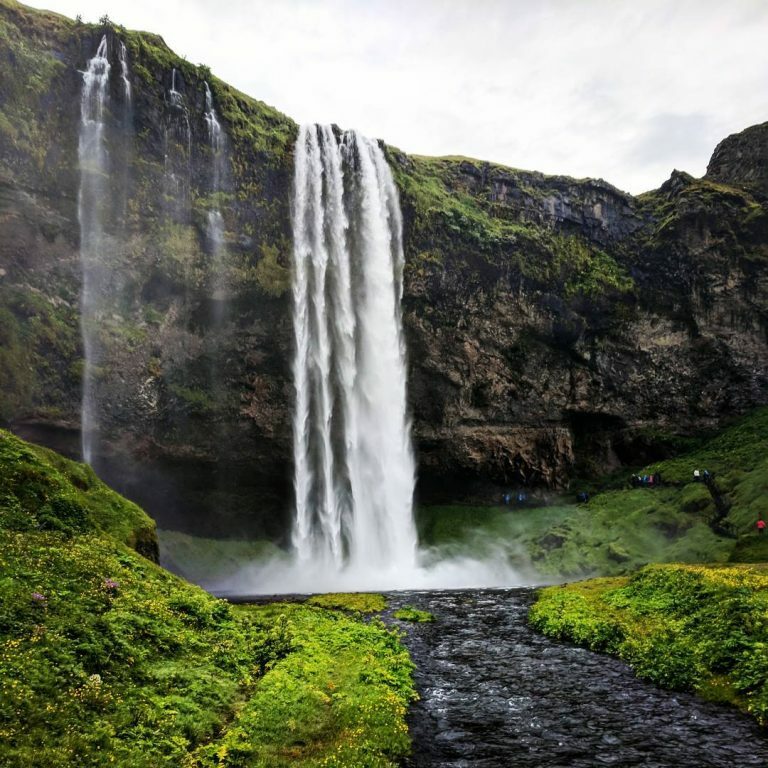 Their website is super easy to use and actually allows you to book an Iceland stopover for multiple days without any additional fees. 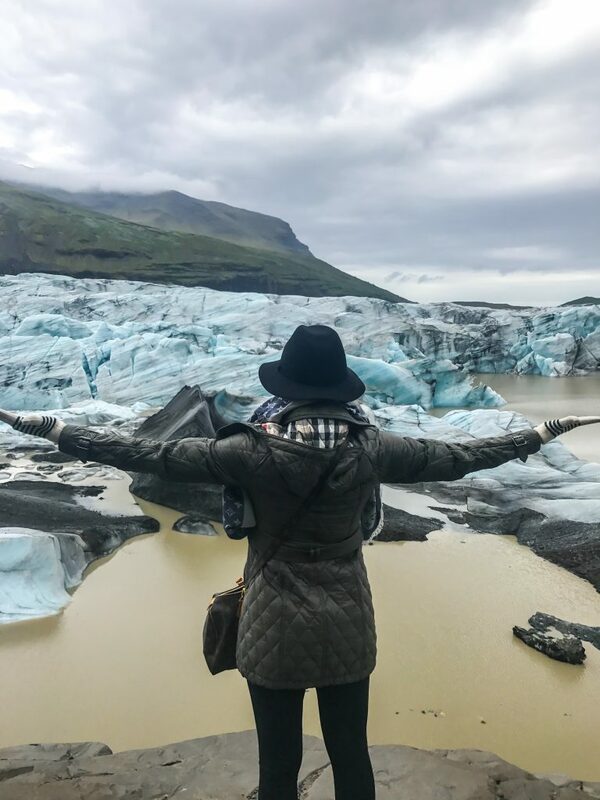 Through Icelandair, I was able to plan the most epic 10-day adventure with 3 days in Iceland, 3 days in London (will have a separate post on London later) and a return flight from Paris after another 3 days of exploring. I highly recommend flying with Icelandair, the plane we flew was upgraded and included in seat entertainment. I felt roomy sitting in economy, but that could have also been because of the fact that Eugene and I had scored our own row of seats. The service was friendly, quick and each person was greeted onto the plane with a bottle of Icelandic water. Our flight got us to Iceland around 6 a.m., where we started our day off right away to avoid jet lag. 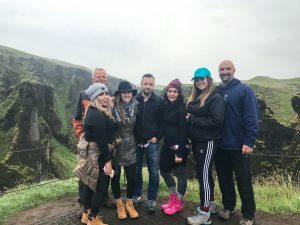 We only had 3 days in Iceland and we wanted to make the best of it, so we decided against driving ourselves and ended up booking a 2.5 day tour with Iceland GoTours. I honestly can’t say enough great things about this company. It is a family operated business run by a father Gunnar and son Bjorn. I worked closely with both Gunnar and Bjorn to plan our groups' itinerary via email. They were super accommodating and willing to personalize our tour. They even did an 18 hour day with us, since Iceland has daylight for up to 20 hours during the summer. Gunnar, or as our group liked to call him, Thor (that’s his middle name) was our tour guide. He picked us up straight from the airport with 2 SUVs. We had 6 people in our group and a ton of luggage, so Gunnar arranged for a separate car to take our bags. This way we didn’t have to waste time going to the hotel, which was about a 40 minute drive from the airport and not in the direction we were going. 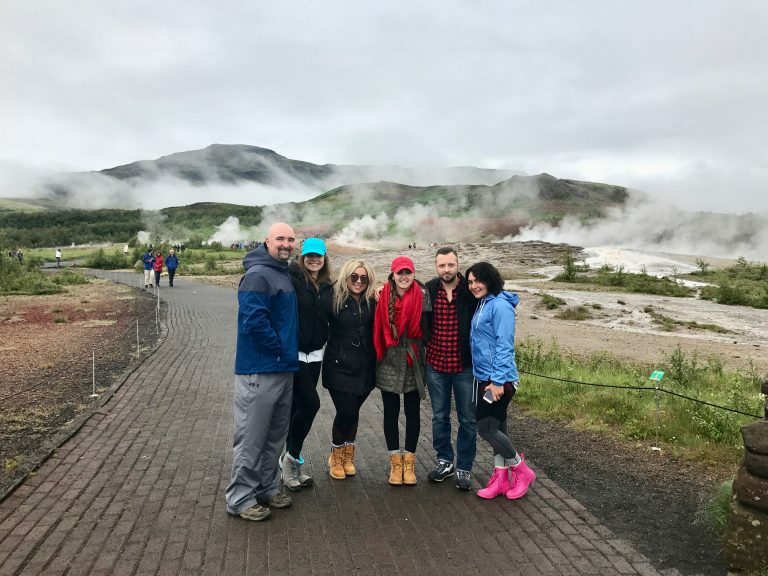 We started our first day off with the most popular tourist spot in Iceland, the Golden Circle. 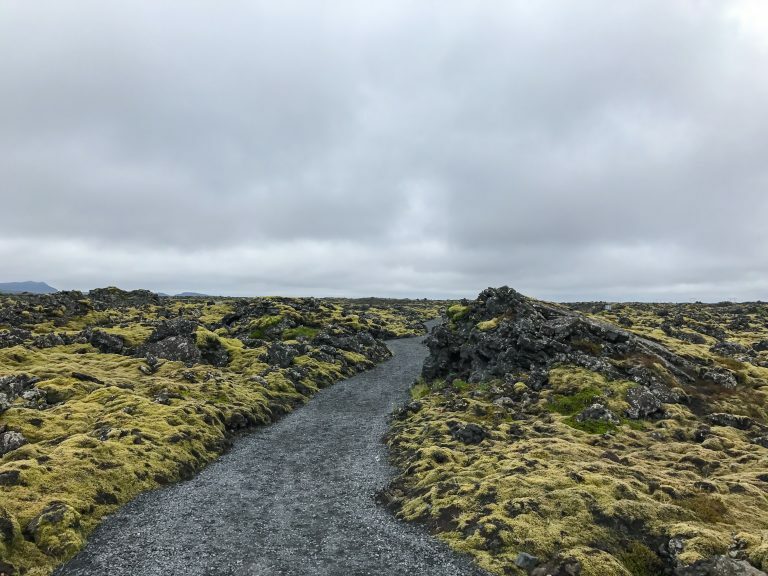 This is a route between several main stops: Thingvellir, Geysir Geothermal and Gullfoss Waterfall. 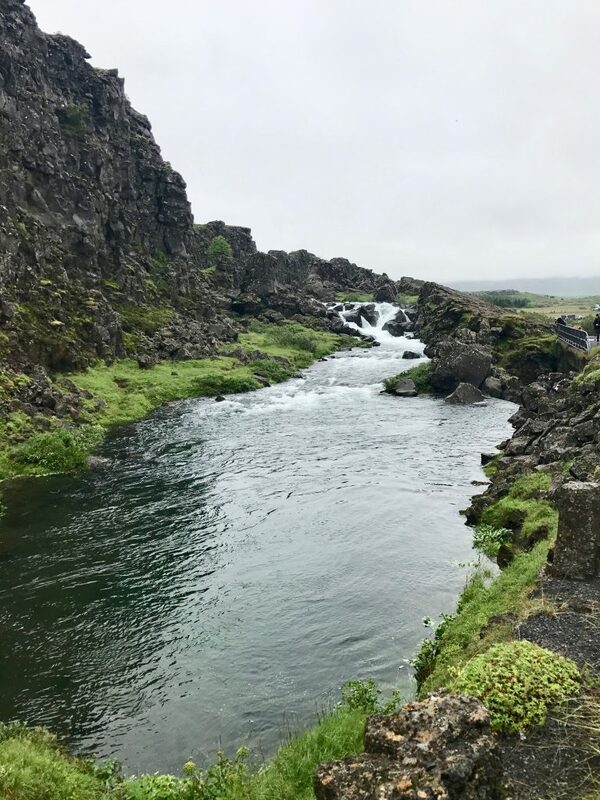 The Golden Circle is one of the main attractions to see in southern Iceland, whether you drive through it on your own or book a tour! 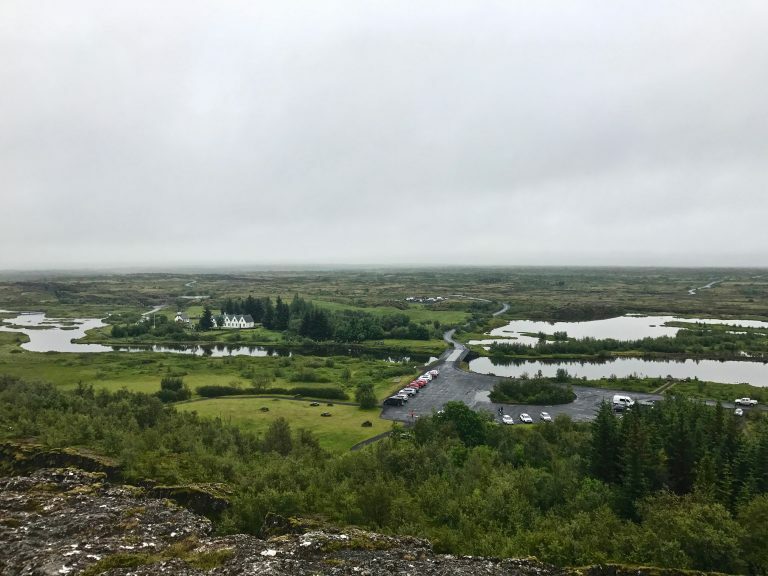 Thingvellir is a historic site and national park, where the Icelandic parliament ruled from the 10th to the 18th century. The park is beautiful, but holds some dark history. 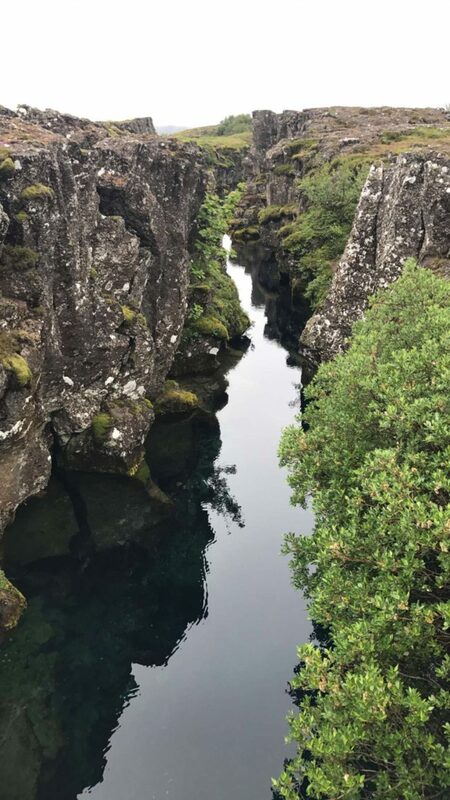 Back in the early 1600s – late 1700s, women were executed via drowning in the Drekkingarhylur (Drowning Pool) that you see on your way through the park. One of my favorite sites here was Peningagja, a pond of crystal clear water where people throw coins from a bridge that lies across it. There is an old superstition that if you make a wish while throwing your coin in the pond, your wish will come true if you are able to watch the coin drop all the way to the bottom. Geysir Geothermal Area is an active hot spring area that houses several small and large hot springs that bubble and/or erupt. 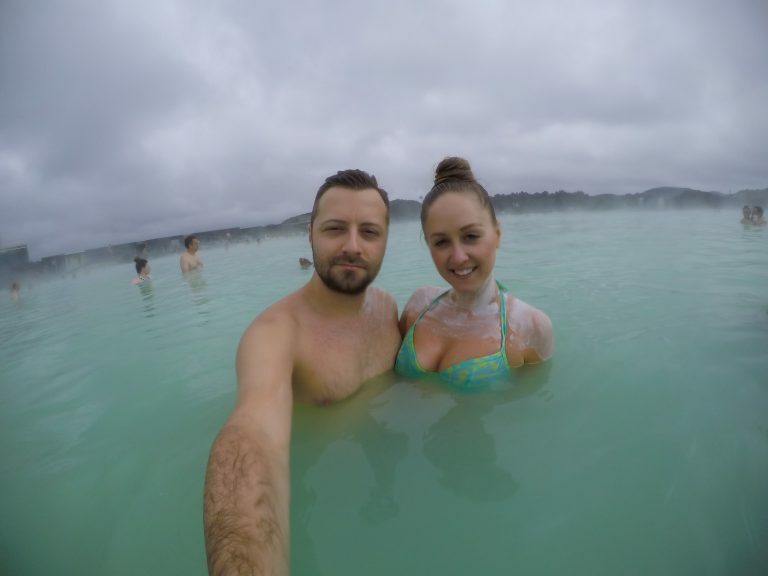 The largest one is Strokkur, which emits a massive amount of hot water every few minutes. 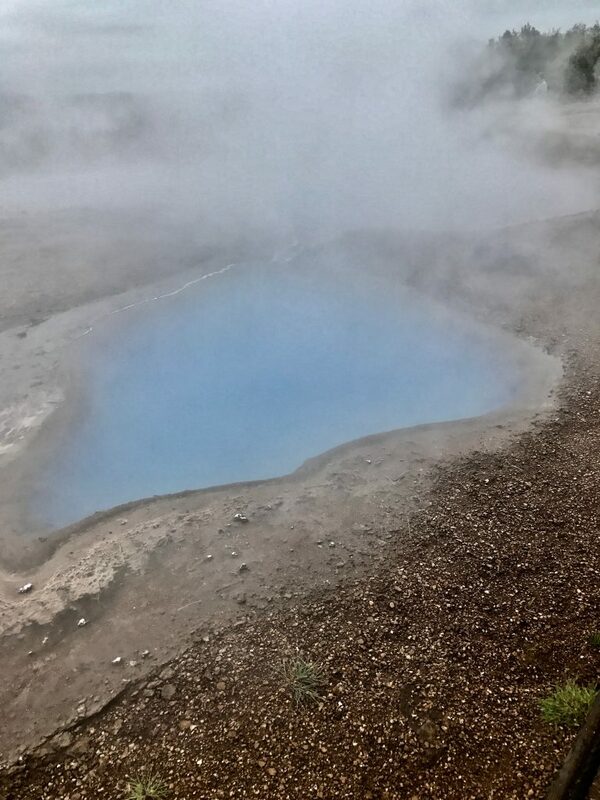 Some of the other hot springs emitted steam and different colored gas. 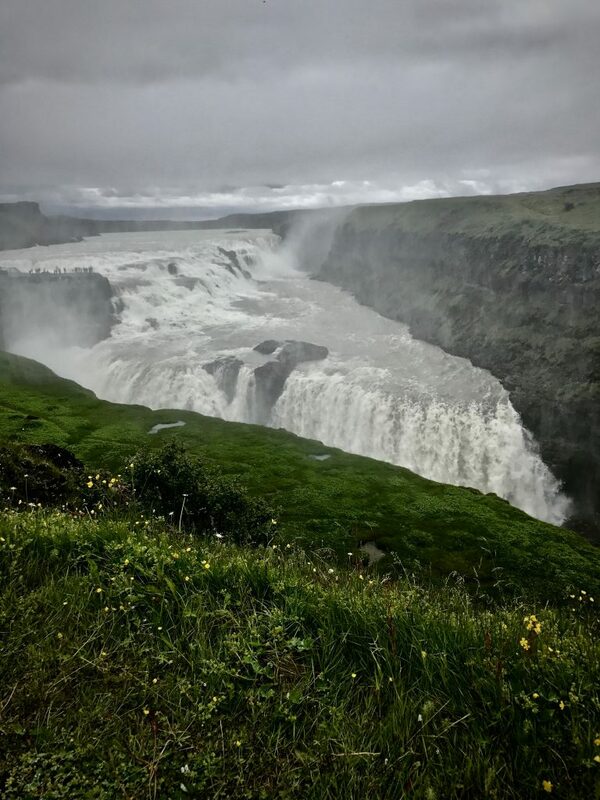 Gullfoss waterfall is one of the most iconic waterfalls in Iceland. I couldn’t get enough pictures of this magnificent beauty. 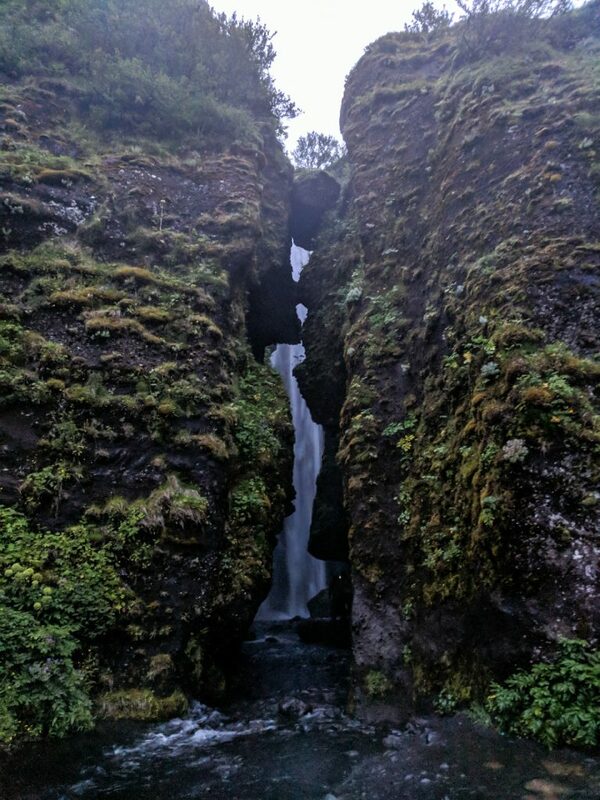 It is located in a canyon that has plummeting water coming down in two stages. 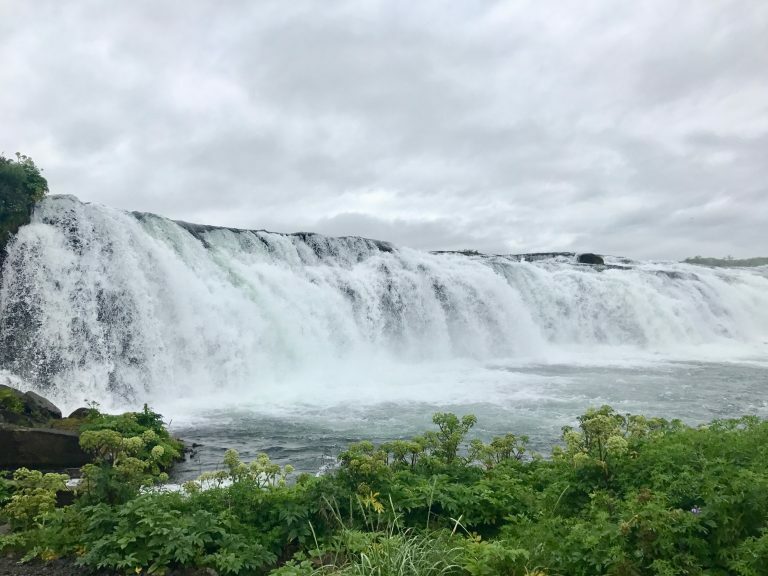 Faxi waterfall is another waterfall on the Golden Circle route, but lesser known. It is smaller than Gullfoss, but still gorgeous and worth a visit. 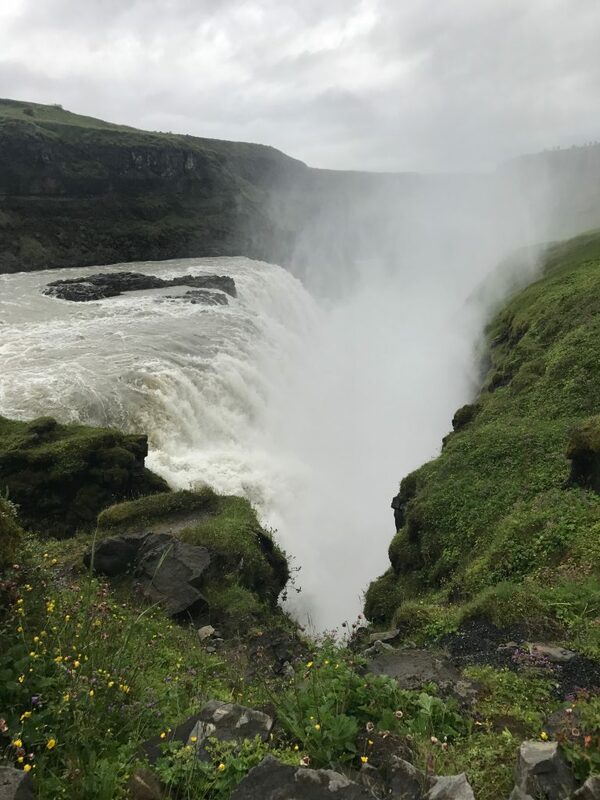 It was about a 5 or 10 minute drive from Gullfoss and a surprise stop by Thor. He had a lot of these! 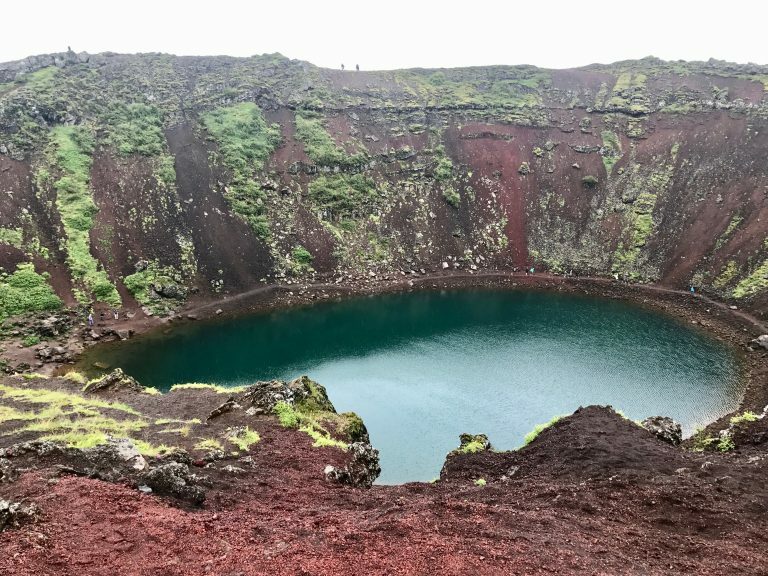 Kerid Crater is a volcanic crater lake in the southern part of the island. This was one of my favorite parts of the day. The Kerid Crater was jaw dropping. The colors, the water, the vast size was mind-boggling. I will mention that there was a small fee to get into the area, but well worth it. You can also hike down to the water, but it started pouring rain pretty heavily on us, so we skipped this part. Our second day was the longest day of the entire trip. We left our hotel at 7 a.m. and we didn’t return until about 1 a.m. 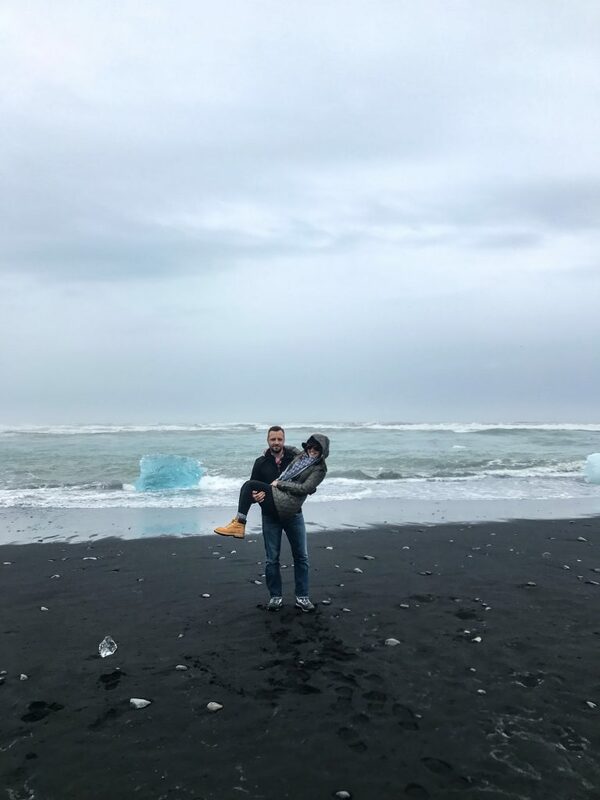 When I was initially researching Iceland, I knew I wanted to make a stop at the Jökulsárlón Glacier Lagoon and Reynisfjara Beach. 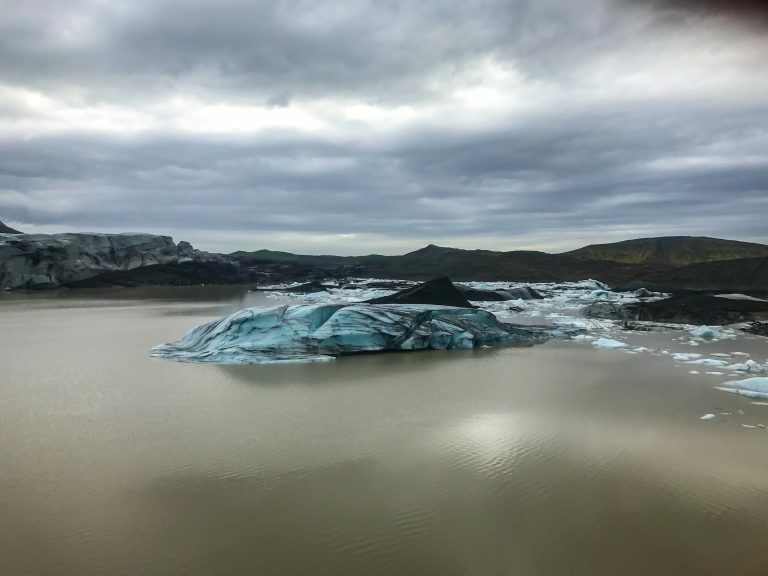 The problem with this is that Jökulsárlón is about 4.5 hours from Reykjavik and many tour operators were not willing to stop at both spots, as the tour would have to be about 14 hours. 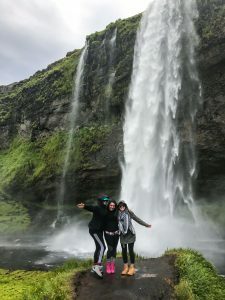 I’m glad I found IcelandGoTours, as Thor was not only willing to do both, but he also added several more stops that we didn’t plan for; including two of our group’s favorites: Svínafellsjökull Glacier Lake and Gljúfrafoss Waterfall. Seljalandsfoss Waterfall was the first stop on our day two adventures. This is another iconic, must-see waterfall that you are able to hike and walk behind. 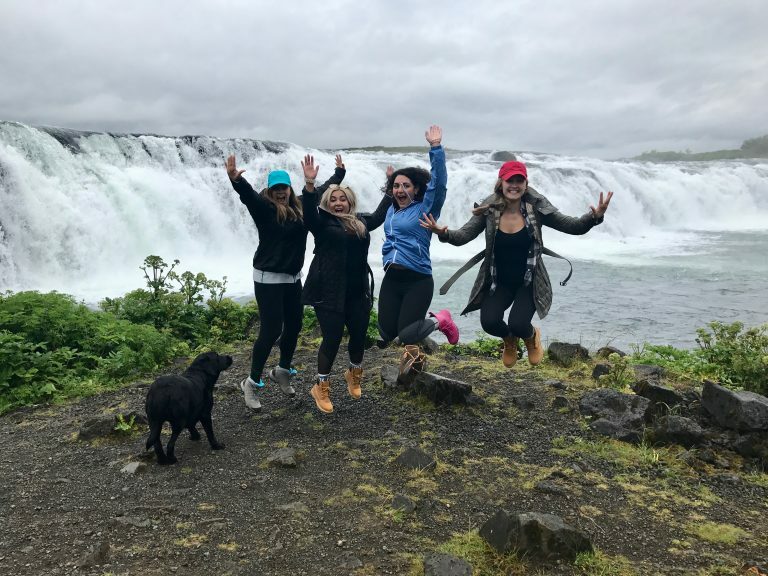 Thor mentioned that we would get wet climbing the waterfall, but we were drenched by the time we got to the other side (should have packed a yellow raincoat). 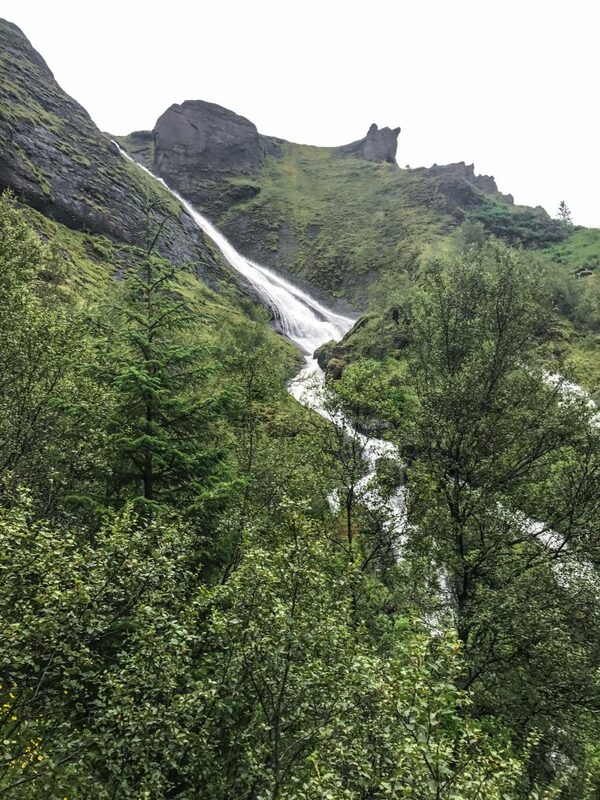 We had a blast hiking the small climb to the top and took in some glorious views from behind and around this cascading waterfall. Systrafoss Waterfall was another stop we made on the way to the glacier lagoon. The mountainside waterfall is surrounded by lush vegetation. We were able to do some short hiking around the area while taking in scenic mountain views. Svínafellsjökull Glacier Lake was not on my list, but I’m so glad Thor took us here. 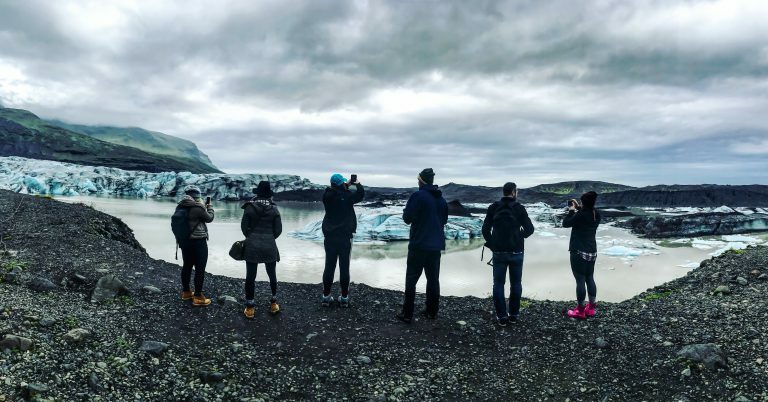 Svínafellsjökull glacier is out of this world. The views are just breathtaking and I could sit in tranquility here all day. I was in awe of the soaring green cliffs, blue ice chunks and serene waters. 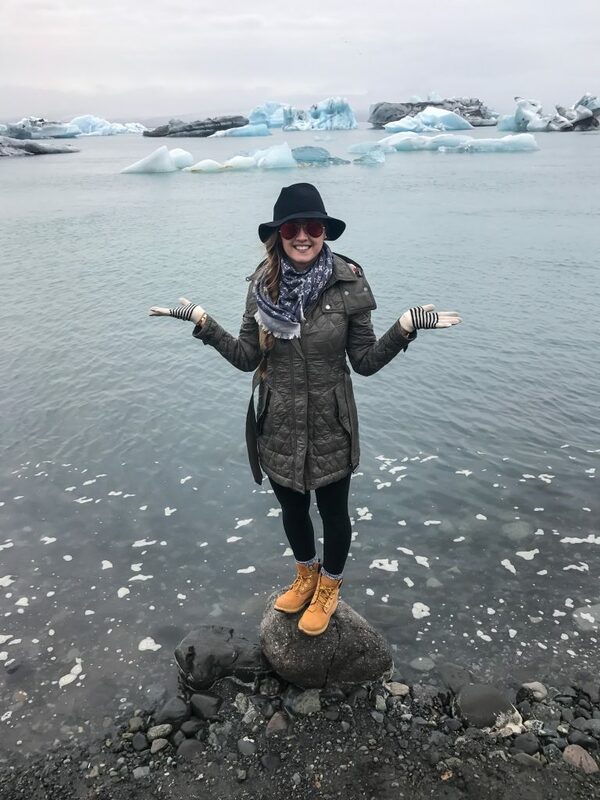 Apparently, people book hikes on top of these ice glaciers, but the view from the ground was just fine. I highly recommend making a stop here on the way to Jökulsárlón Glacier. I actually think the views are much better. 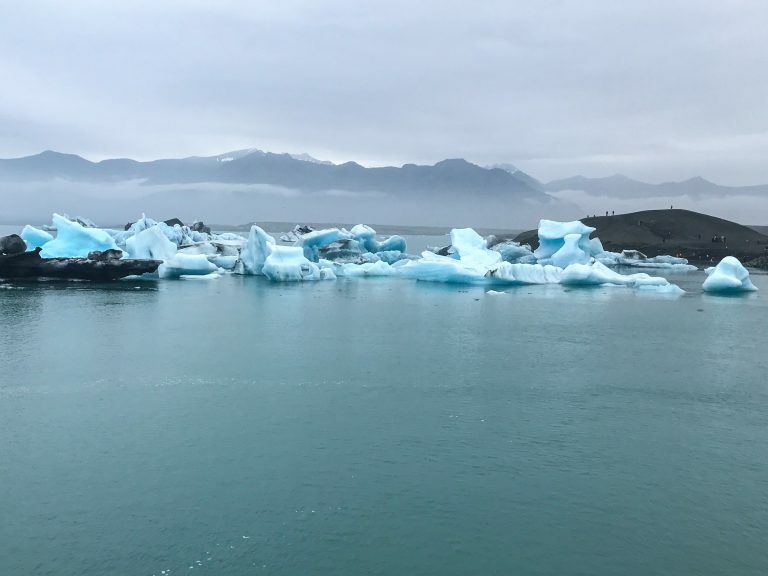 Jökulsárlón Glacier Lagoon is a must stop in southeastern Iceland. 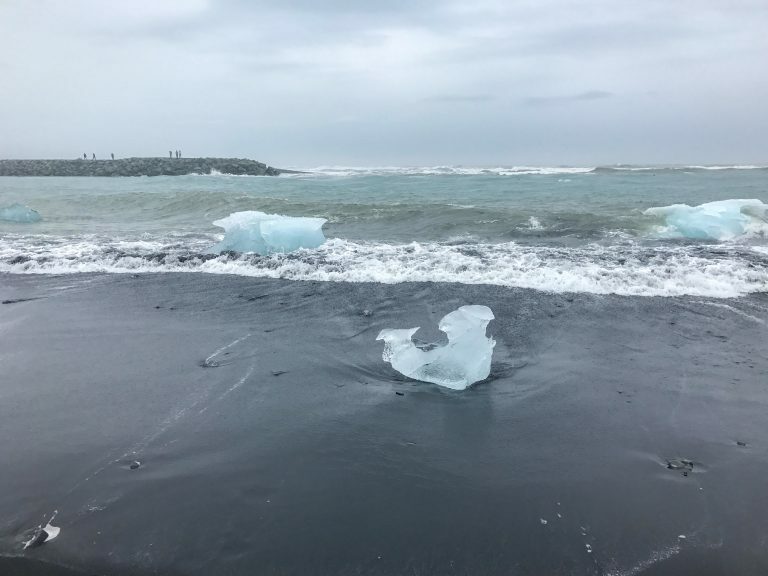 The lagoon is filled with enormous hunks of ice, broken icebergs, and tides of blue and white shades. I was hypnotized by the peacefulness of the water and floating chunks of ice. 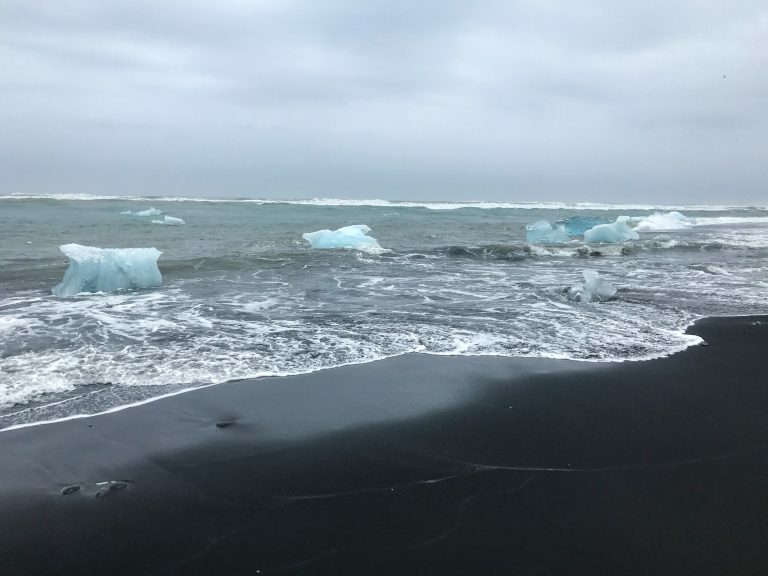 Diamond Beach is right across the Jökulsárlón Glacier Lagoon, where the icebergs meet the Atlantic Ocean. 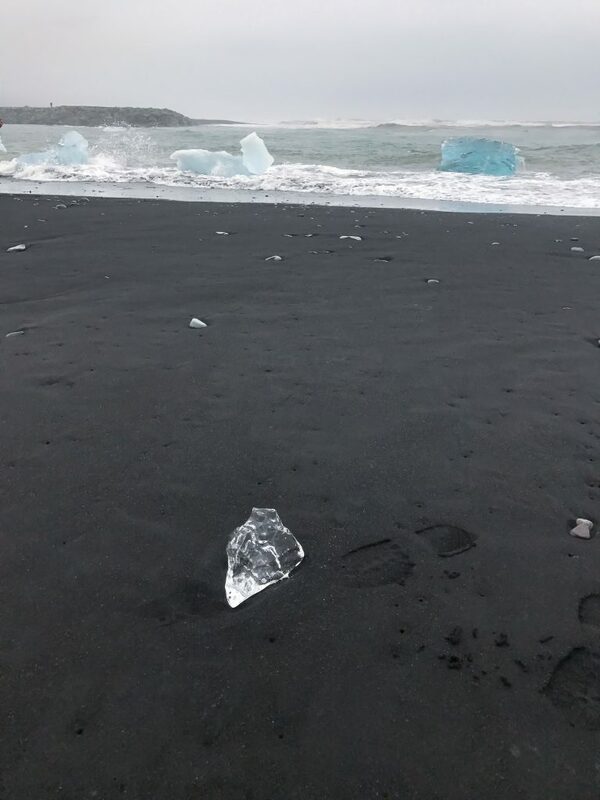 You can actually see pieces of crystal ice wash ashore. 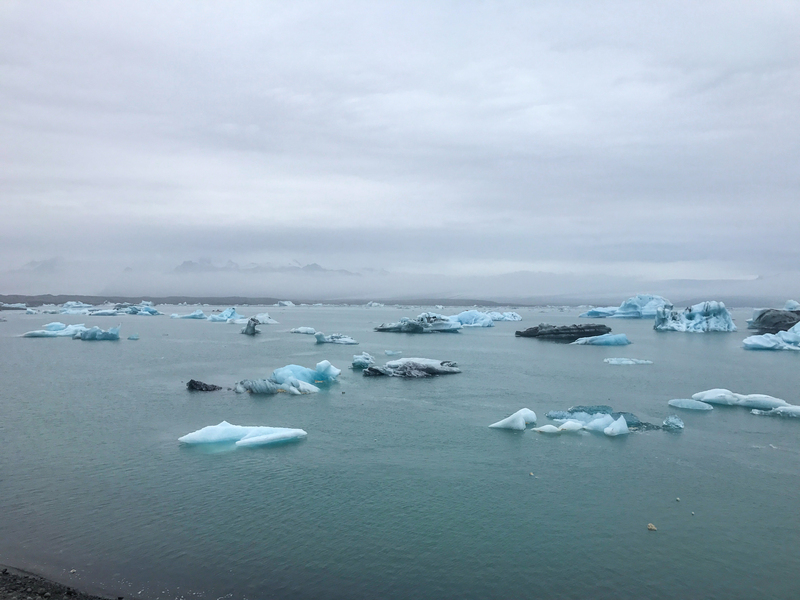 It was mesmerizing watching the waves beat against the iceberg bits from the Jökulsárlón glacier. These chunks wash ashore as smooth diamonds both large and small in size. I could have stayed here for hours watching the diamonds float ashore, but it was windy and cold so we had to move on. Fjaðrárgljúfur Canyon was another surprise stop by Thor. 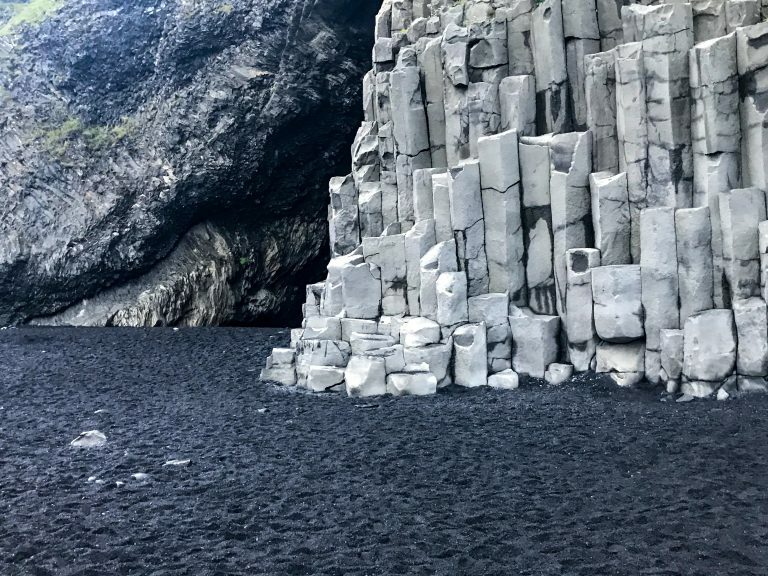 This place looks straight out of Game of Thrones, which apparently filmed many scenes throughout Iceland. We stopped here on the way towards Vik and Rreynisfjara Beach. We climbed a short hill to the top to the most magical views of mountains, sky-high green rock canyon walls and a clear river running in between. 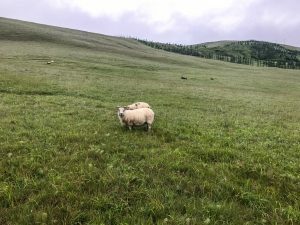 As if this place wasn’t mesmerizing enough, there are sheep roaming throughout the hills. I was actually able to get pretty close to a few grazers, which made my day. 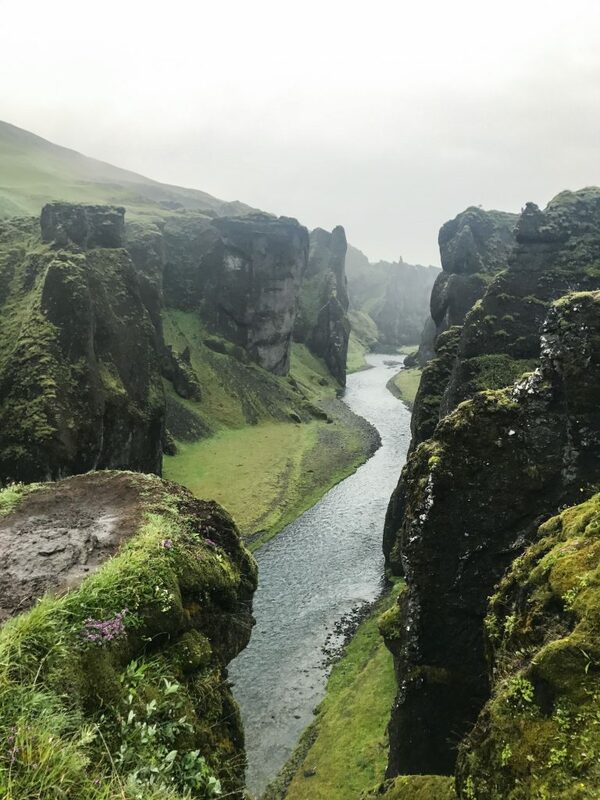 While Fjaðrárgljúfur Canyon isn’t something that is advertised as much as some of the other sites like the Golden Circle and Jökulsárlón Glacier, it is a must-see stop. 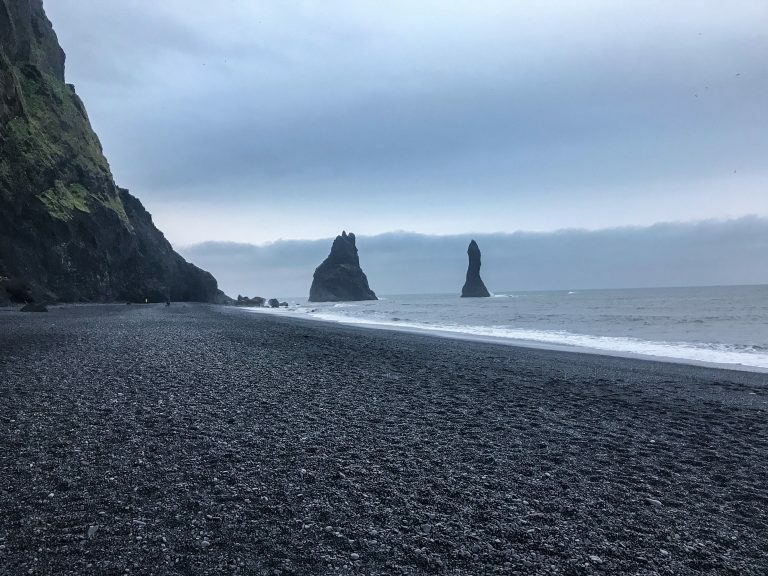 Reynisfjara Beach is probably the coolest beach I have ever visited. The sand is jet black and filled with smooth black pebbles. The day we were there it was incredibly windy (and cold) and the waves were pretty aggressive. There are signs everywhere warning tourists to stay away from the waves as they can be lethal. Apparently a few tourists have died here over the last few years! 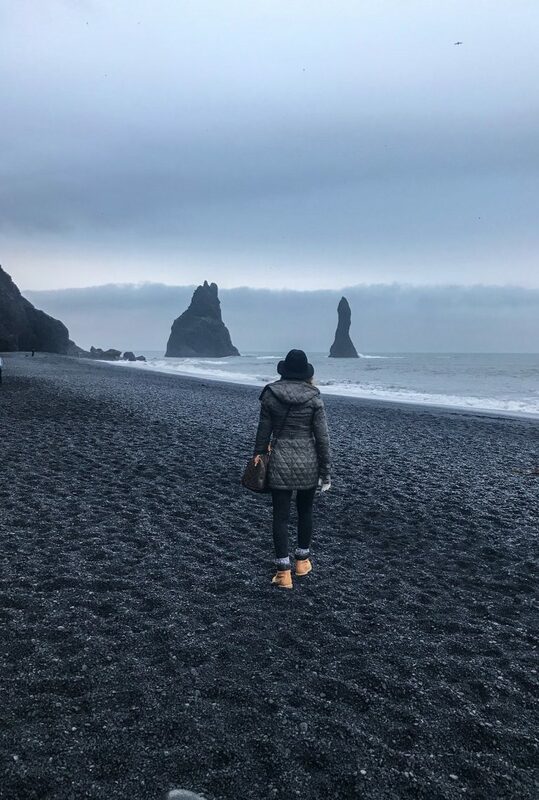 As if the beach itself wasn’t gorgeous enough, there are a few other highlights including a stunning sea cave, cliffs, and unique sea stacks alongside the beach. So much beauty here! We also stopped by the Black Beach Restaurant right near the beach. Thor ordered our group the most delicious lamb soup that I’m craving months later. Skógafoss waterfall was a quick stop for us towards the end of the day. 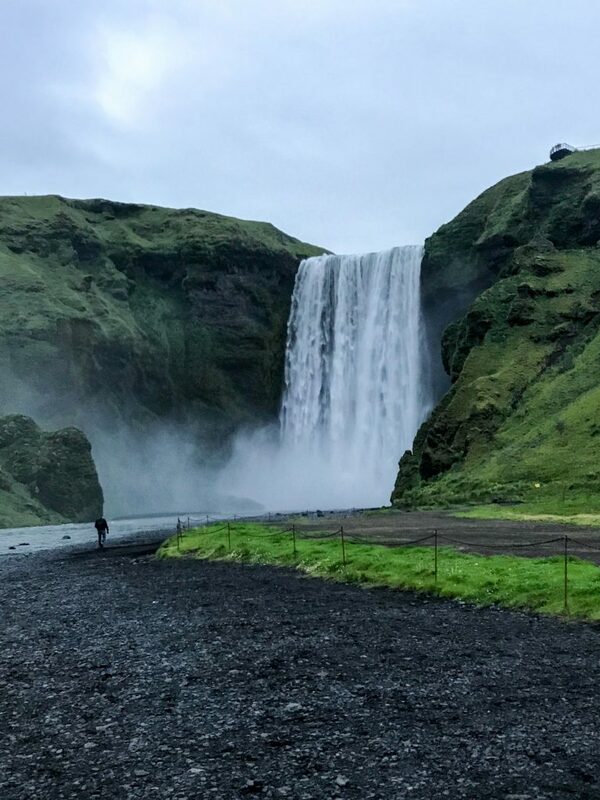 It is one of the biggest and most visited waterfalls in Iceland. You can drive right up to the waterfall which streams down into a shallow river. There is also a path of stairs leading to the top, but we were unfortunately too exhausted to climb it. Gljúfrafoss Waterfall was our last stop of the day, but it is right next to Seljalandsfoss (our first stop). We were so tired and ready to go to bed, but Thor would not let us give up. It was around midnight and he wanted to show us one more hidden gem. It was still light out when we made our trek towards Gljúfrafoss . I’m so glad Thor didn’t listen to me and took us to this last stop. Gljúfrafoss peeks out from behind large cliffs and a stream leads to a small opening in between the cliffs. We crossed the stream through the opening and into the cave. Once we made it inside, the view took my breath away. 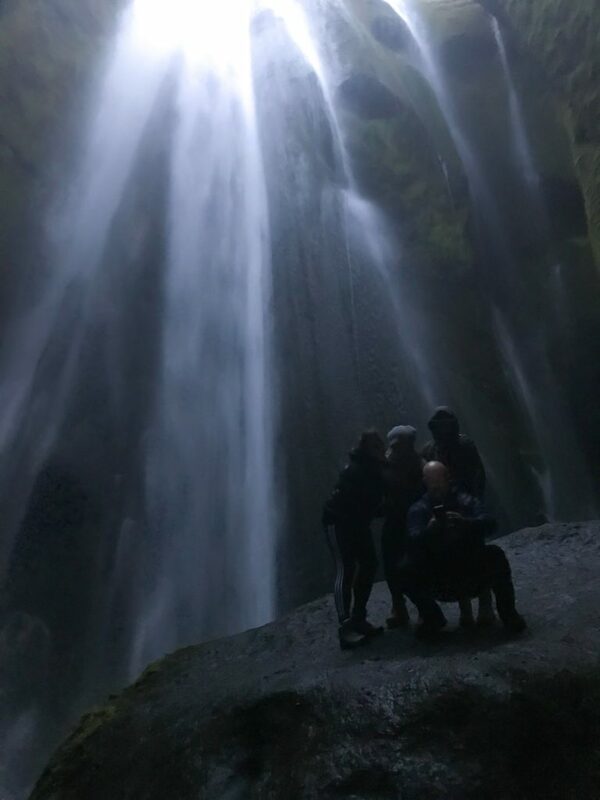 I wish the pictures turned out better, but we literally walked straight into a cascading waterfall surrounded by green moss and cave walls. This was one of the most memorable experiences of my life and a remarkable way to end the second day of our trip. Hotel: While in Iceland we spent 2 of our 3 nights at the Skuggi Hotel in Reykjavik, a boutique hotel in the heart of the city. As with the majority of hotels across Iceland the rooms were tiny. There was just enough room for a bed, nightstands, TV and small bathroom. We truly didn’t need much else because we weren’t in our room for more than 5 hours a day. The hotel was a newer construction and was spotless, offering complimentary Icelandic style breakfast each morning. Since the hotel was centrally located, we were also able to walk to dinner and explore the city a bit at night. I do wish we had a little more time to do a food tour and take in some of the main landmarks in the city, but there is never enough time. 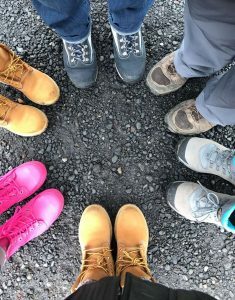 While planning our trip, I wanted to make sure that we had one full day to relax after all of the exploring and hiking we had planned. 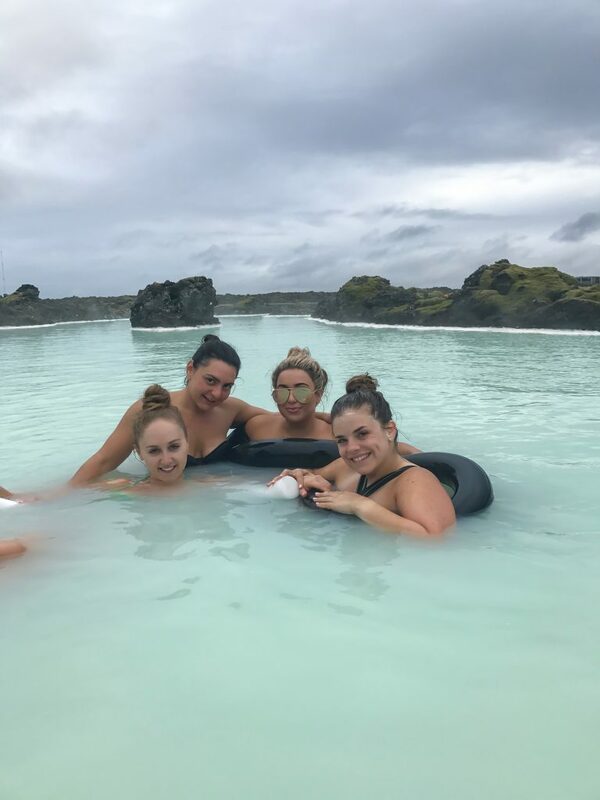 The Blue Lagoon is actually about a 15-20 minute drive from the airport so I wanted to do this either the first or last day to avoid driving back and forth. 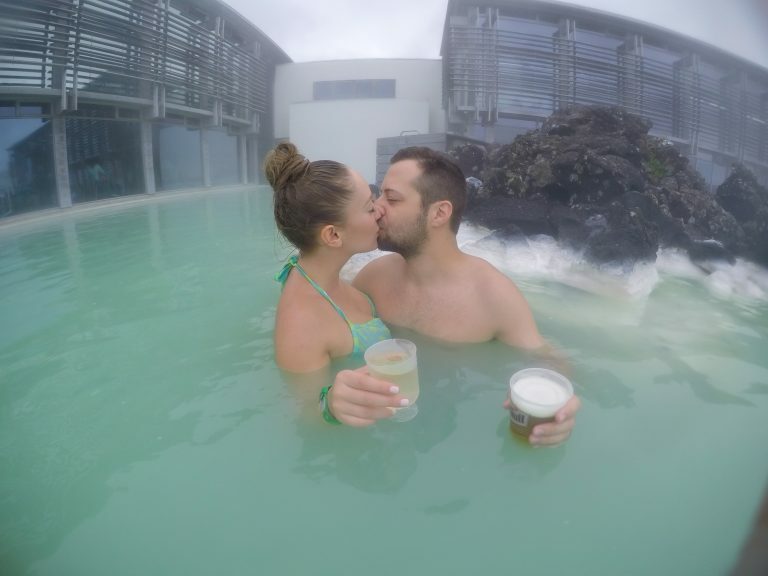 We ended up saving our 3rd and final day for the Blue Lagoon. After all of the traveling, hiking and sightseeing, it was nice to just relax. 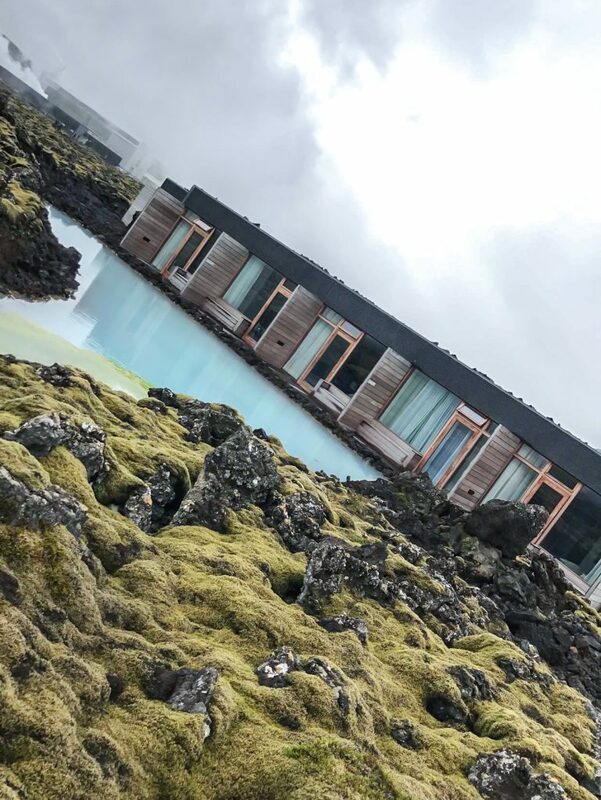 With the Blue Lagoon being a bit of a drive from the city, we decided to stay overnight at the on-site hotel called the Silica. This way we had a full day to relax and enjoy the hotel amenities including their private lagoon. Our flight to London was at 7 a.m. the next day, so this worked out really well. The hotel also offered complimentary breakfast, but since we left for the airport around 5 a.m. they actually prepared breakfast bags to-go for us. The hotel is euro modern and set among volcanic fields, moss and blue waters. We had such an unforgettable stay here. Thor came the morning of our third day to pick us up from the first hotel we stayed at and dropped us off at the Silica, which was about a 30-40 minute drive. This way we didn't have to book separate transportation. 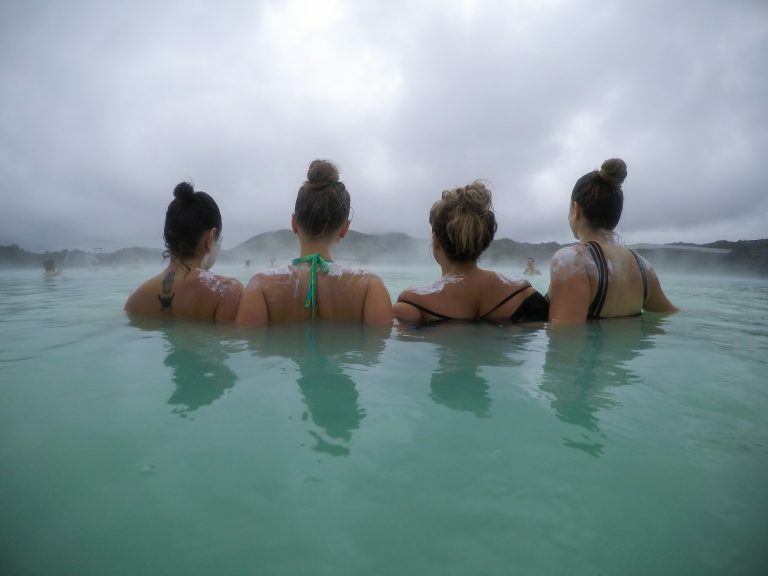 The Silica hotel is less than a 5-minute walk to the Blue Lagoon (they also have a shuttle). The boutique hotel only has 35 rooms and they book up pretty far in advance. I booked the hotel in February for our July stay. This was by no means a cheap stay, as with the rest of Iceland it was an expensive treat. We paid about $600 US for one king room for the night. 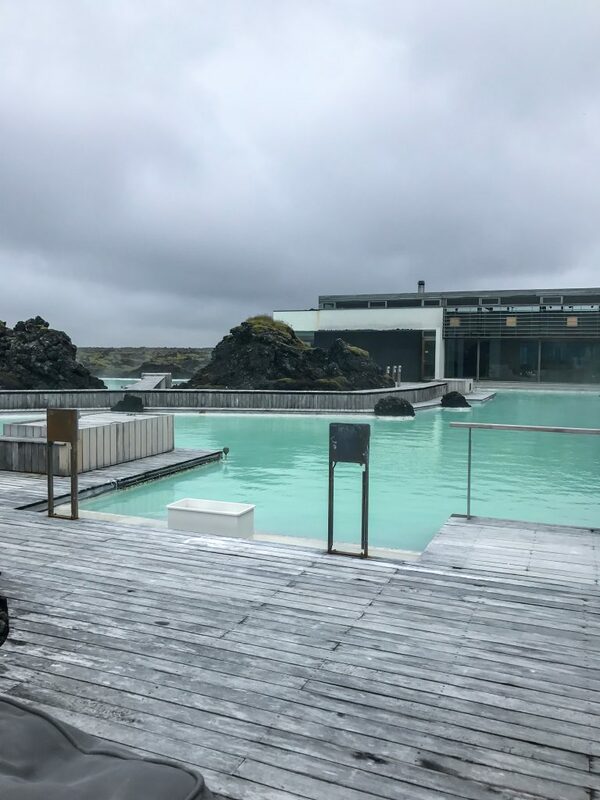 Each room came with 2 premium “free” passes to the Blue Lagoon. The passes are typically $100 per person at the lagoon, so I felt like $400 for the actual room wasn’t bad at all. Once we got to the Blue Lagoon, it was pretty crowded, but the lines went really quick especially since we already had passes with the hotel. The lagoon offers several different types of packages ranging from $60 US to $250. 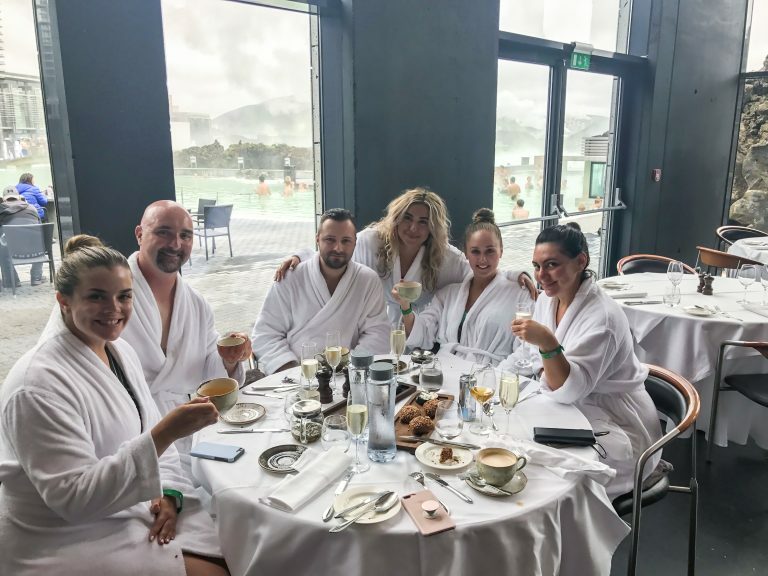 Again, we got the premium pass which included entrance to the Blue Lagoon, Silica Mud Mask, use of a towel, 1 free drink, algae mask, use of a bathrobe, slippers, and free champagne at the on-site restaurant. While we were there they were doing renovations to expand the properties on site. They are introducing a new hotel and an additional lagoon. The Blue Lagoon area was surprisingly large. Although there were many people there, it didn’t feel overcrowded or clustered. The temperature outside was about 50 degrees F, but between the hot waters and the steam it felt perfect. We spent a good hour or so relaxing in the waters before heading to grab lunch at the Lava Restaurant. Originally we weren’t planning on having lunch at the Lava Restaurant, as it is an expensive place, but I’m glad we did. What an experience! First of all, the restaurant décor is gorgeous. 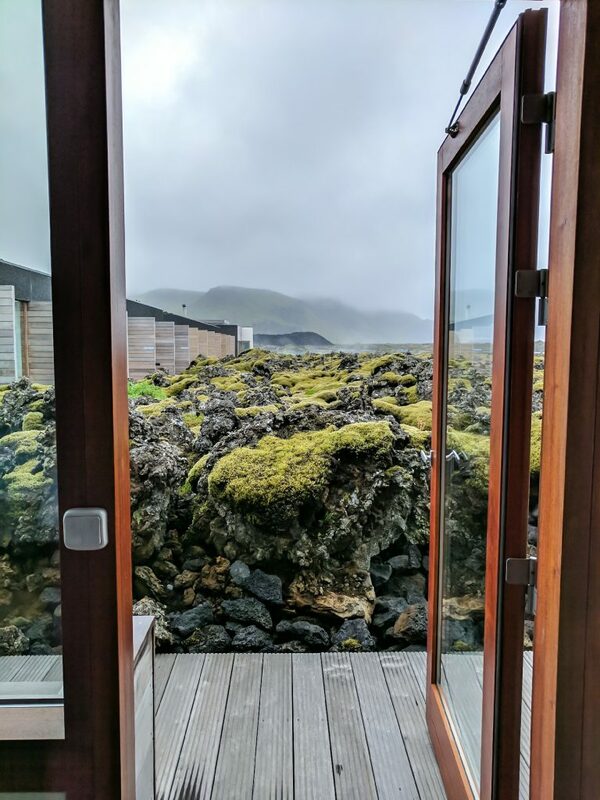 It is a first class restaurant with modern Icelandic dining and it faces directly outside to the lagoon. The best part about this…we wore our robes for lunch! The food was great as well, Eugene and I shared the 3 course lunch with an appetizer, entrée and dessert. We also received a complimentary glass of champagne with our premium passes. We spent the rest of our day at the Silica’s private lagoon. 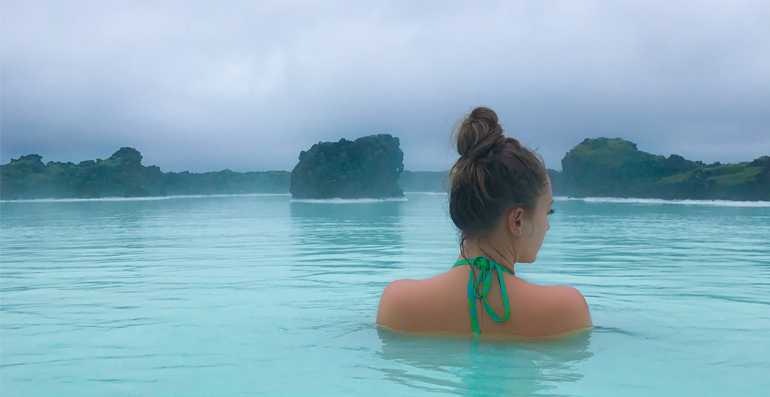 This was honestly even better than the actual Blue Lagoon. It is smaller in size, but still plenty large for our group of 6. For a while we were the only ones there, only to be joined by 2 other small groups. We spent 2-3 hours lounging at the private lagoon. They had floats and pool tubes, silica masks and drinks available. 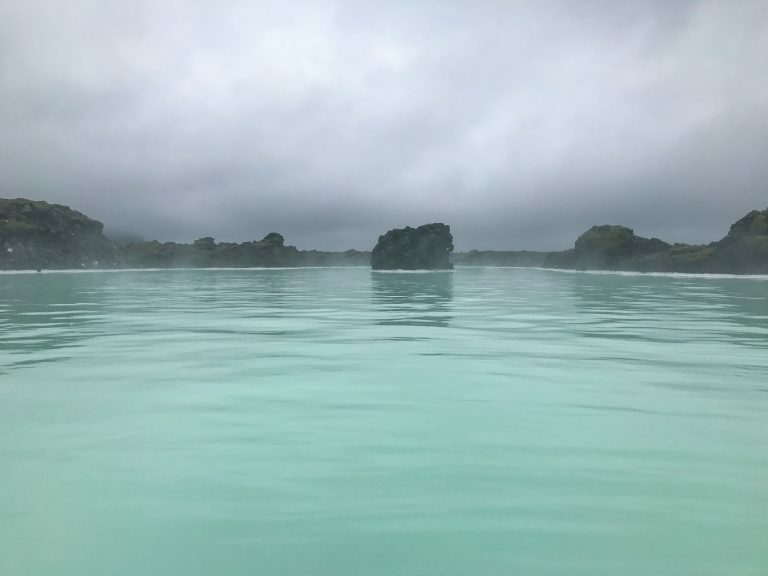 We enjoyed our time so much at the private lagoon that we never made it back to the Blue Lagoon, which I was fine with. 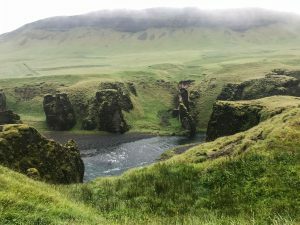 Final thoughts: As I mentioned in the beginning of my post, there is a lot to see in Iceland. While 3 days was perfect to experience the best parts of southern Iceland, I can’t wait to go back. Since we visited in the summer I would like to come back in the winter to see the northern lights, which typically happen between September and April. The weather in the summer was still pretty chilly, so I can’t imagine how the winters are. We averaged daily temperatures in the 50s with wind and rain on most days. In regards to food, although the meals we had were always fresh and flavorful, they were costly! 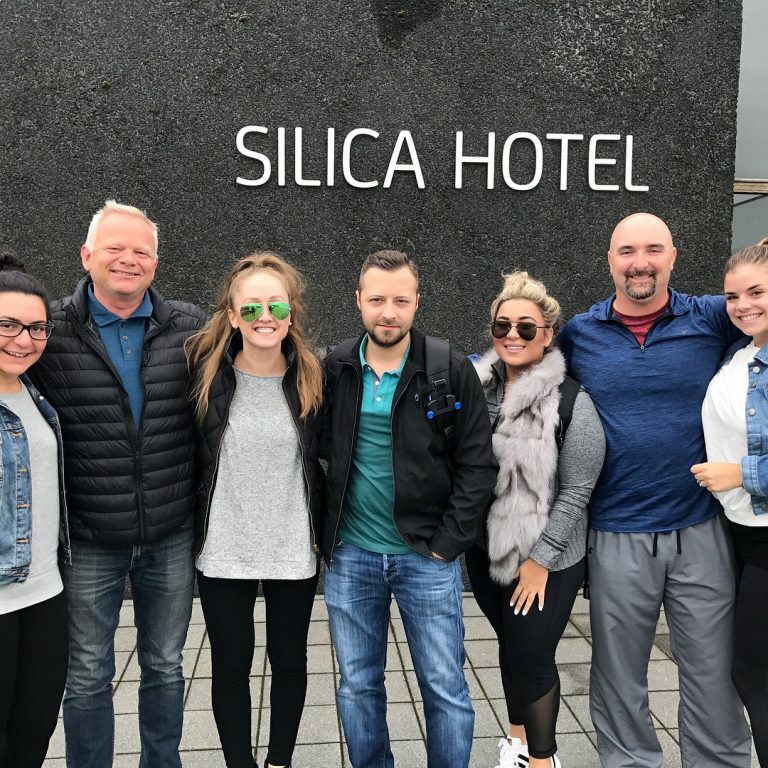 Again, I’m so glad we found IcelandGoTours and I would 100% book with them next time, but I would trust Thor and Bjorn to plan all of the stops.